So I've installed the correct version of unity and updated the daggerfall-unity-master to the current build but I can't see the tab at the top with the mod export tool. How do I get it back? I'm updating the collision meshes for the shelves, hopefully that will fix the issues with clicking them. I think it would be much better if we could just drop the .prefab files into a folder called StreamingAssets/Meshes. New test release: 1.42c. I haven't fully tested it so would appreciate some help with that. Windows only for now. Once it's bug-free I'll put the link in the top post. Re-compiled the mod with the latest version of DF Unity and Unity version 2018.2.11f1. Hopefully this will solve some of the crashing issues with the more recent builds, especially on Linux. I had to copy over a lot of different assets from many different folders for this to work so I may have missed a texture or two so please let me know if you find any missing textures. I was unable to create the mod for linux and mac for some reason. I've attached the error log below. 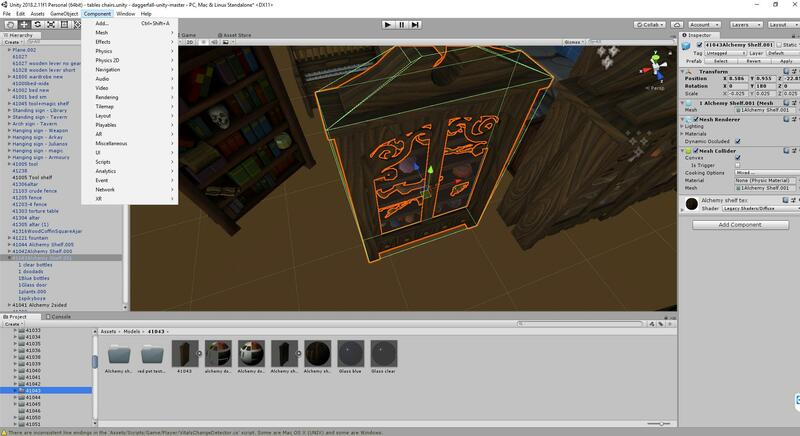 Alchemy shelves and bookshelves are now (hopefully) fully clickable. I may have missed some models so let me know if any are still not working properly. Fixed the double wardrobes, the old model put them further to the right than they should be. Now they are in their correct position. Fixed the floating altar. I have not verified this in-game myself. Building an AssetBundle for target 'LinuxStandaloneSupport' is not allowed because the required module is not installed. I've downloaded, and will test. -I cannot interact with any shelves in any bookstores. At all. -Alchemy stores use the alchemical shelves/cabinets in sets of 4 (two next to each other, backed by two more), but only one in a set will be interactable. Ideally, all 4 should share the inventory. -The small weapon/armor stores will have a rack backed by a bookshelf with a skull, and the bookshelf is not interactable, only the rack. -Racks with the armor are not interactible while the weapon racks next to them are. I think they should both share the same inventory if possible. Aside from those, the shelves in all the other store types are much better than they used to be. Personal thing, nothing to do with bugs. But I'd maybe like if weapon racks had a backing to them so you don't have to always click exactly on the frame or a weapon to look at the inventory. Although like I said, this isn't a bug, just a personal preference thing. I second this. But I'm very glad to see the mod source is going to be made available to other modders for future-proofing purposes - I don't see this one ever leaving my load order. Thanks a lot! I will try to make it so that weapon shelves trigger even if you click on the hollow parts. Hey AlexanderSig, I just wanted to say it's great to see you around again. I don't know why you're having trouble building for Linux/Mac. Hopefully one of the more experienced mod guys like TheLacus will be along soon to help further. When you run the Unity installer you can see a list of checkboxes. Two of them are respectively called Linux Build Support and Mac Build Support or something similar. Hopefully you can run the installer for your installed version to add these two components, without a complete reinstall.